4 Pics 1 Word jar of honey. Road with many cars. Croissants. Breakfast with strawberries. Thanks for visiting 4-Pics-1-Word.com, here are the cheats for your favorite game. 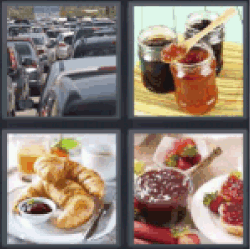 4 Pics 1 Word jar of honey.